Not to be confused with the town of the same name in Northern Ireland, our book is about the wee but ancient place in Ayrshire now overshadowed by its bigger neighbour, Troon. 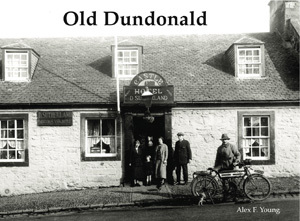 Dundonald’s origins are in its 12th century castle and its earlier church, the parish church. With few industries other than quarrying (featured in the book) and working the land, the village has grown slowly, dwarfed by Troon and Irvine on either side. The photos in the book reflect this situation, a quiet village situated between two large and busy towns, so the street scenes shown are sparse of folk and out of town the scenes shown are of modest country houses, farms and Hillhouse Quarry, the convalescent home and the V.A.D. of the First World War.